OH YES WE DID! 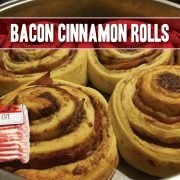 Bacon Cinnamon Rolls, featuring Indiana Kitchen bacon! An indulgent breakfast treat to enjoy with the family over holidays before those pesky New Year's resolutions kick in. Place bacon on a foiled-line baking sheet and place in oven for 10 minutes (bacon will finish cooking in later step). After 10 minutes, remove bacon from oven and place strips on paper towel-lined plate. Use paper towel to dab excess grease from bacon. Remove cinnamon rolls from package, and one by one, unroll cinnamon roll dough. Layer a strip of bacon on top of cinnamon roll dough and roll back up to return to original shape. You may first want to cut bacon in half lengthwise in order to better match the width of the dough. 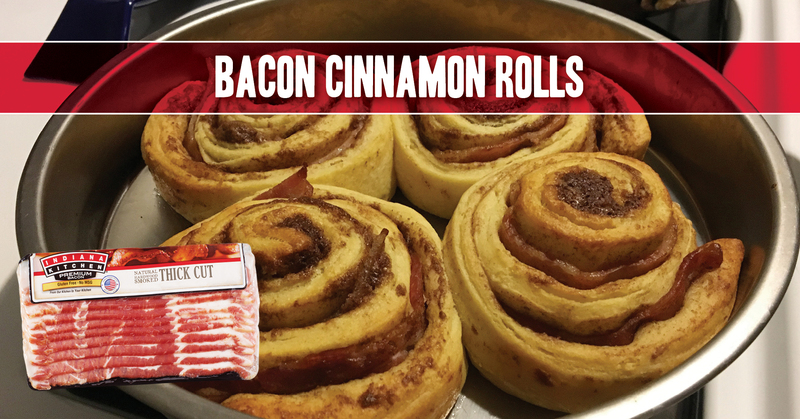 Once all rolls have had bacon added, bake rolls according to package directions, adding icing at the end. Enjoy! *You will have extra bacon leftover, which you can finish in the oven by cooking for another 10 to 15 minutes at 400 degrees F.